Warren Lewis's career as an innovative barber started with a chicken in Mississippi. Now, at 80, Lewis has been using his unique flame technique to cut hair in North Memphis for more than 60 years. Lewis still works out of the barber shop he bought on North Danny Thomas in 1965. The building is bigger than it looks, but the shop occupies one long, narrow room. Lewis's barber stand is the first one, the most cluttered one, and the one closest to the jukebox, which is packed with vintage soul 45s. He's a friendly man with a puffy shock of white hair and a near-constant smile. He offers hugs and handshakes to everyone who comes into the shop and gossips with his clients while they wait. 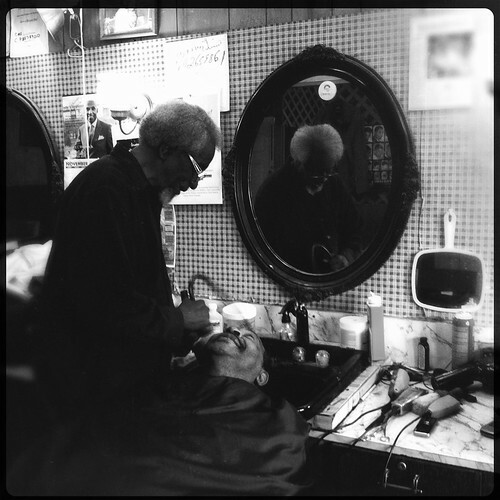 Lewis has been cutting hair consistently since he moved to Memphis from Mississippi in 1951. 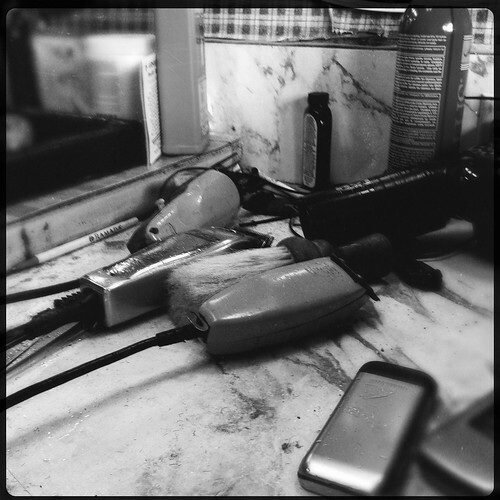 When he started, he charged 50 cents for a haircut. "My first week, I made $19!," he laughed. "It was a lot of money then." Though most of the haircuts he gives now involve clippers and scissors, he's still best known for his method of cutting afros with fire, which he claims makes his haircuts last longer and grow out more evenly. He developed his patented method after realizing that the technique his mother used to burn the feathers off of chickens could be applied to human hair. Here's how it works: Lewis lights long, skinny tapers, then touches the flame to the client's head. Once the hair has burned to the desirable length, Lewis snuffs out the flame with his hands. He's careful to put the flames out before they turn from yellow to blue, lest he burn the client. In more than 50 years of using this technique, there's only been one accident, on an early client. "He had oil sheen in his hair," Lewis explained. "Oh, lord, I've done it so much now that I'm able to do it on anybody, no matter what he has in his hair." Flaming Fro from Karen Pulfer Focht on Vimeo. This unique method has earned Lewis quite a bit of fame, a fact that he seems genuinely proud of, and more than a little amused by. The last thing he wants, after all, is "to get the big head." When he took me upstairs to see his collection of memorabilia, he proudly pointed out photos of all of the famous people who have sat in his barber's chair and showed me photos of his trips to Japan and his appearances on late night talk shows before cracking himself up and saying, "Burning feathers off a chicken took me all over the world!" Despite his notoriety, Lewis is a fixture in his north Memphis neighborhood. A sign outside of his shop proclaims that section of North Thomas to be "Warren Lewis Street", and the shop's building (and the immediate area) are referred to as Warrentown. (Fun fact: Lewis – really, who else – was elected mayor of Warrentown in a mock election in 1994). In addition to his work as a barber, Lewis founded the Black Knights (an economic development organization), was involved in the civil rights movement and organized the Emergency Assistance Bank, a food bank that served the neighborhood around his shop. At 80, Lewis hasn't shown any signs of slowing down. He still works in the barber shop every day, laughing and joking with customers who come from all over the city for his services. When asked if he would ever retire, Lewis got quiet and said, "I was able to see that the sky was the limit, and I haven't scratched the surface yet."